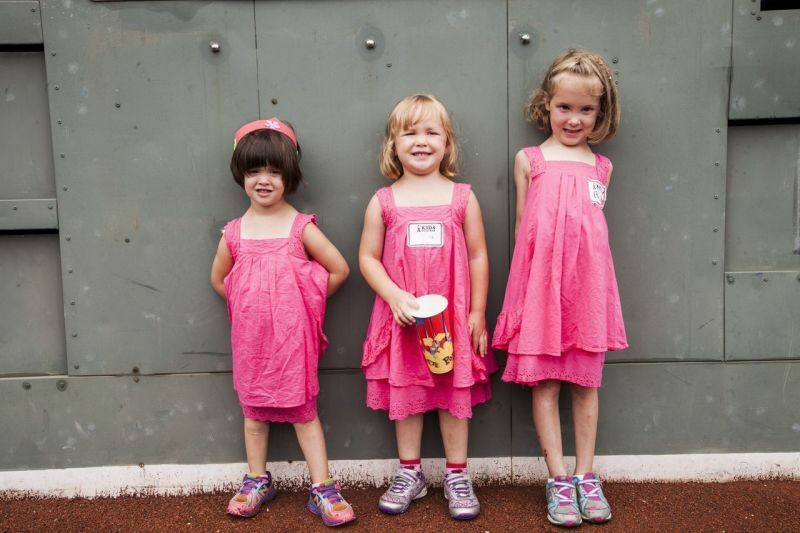 Despite the rainy weather, children and families beamed with joy during the 6th Annual Kids Golf Day at Fenway Park. On Wednesday, July 16th, over 150 children and family members impacted by cancer came together for a day filled with laughter, memories, and hope. Boston Duck Tours brought guests out of the rain and into Fenway Park where children collected Kids Golf Day t-shirts courtesy of Puma, enjoyed breakfast, and began to explore the variety of activities. The talented teen band “Preminishun” welcomed guests with an excellent performance, singing and dancing to various top hits and raising the energy level. Metro Mini Links supplied a 9-hole mini golf course, and PGA Professional Andrew Walkley brought his team from Eastward Ho! to lead a golf skills clinic. Children received Bears for Humanity stuffed teddy bears, and could decorate accessories for their furry friends at an arts & crafts station. Wally the Green Monster made an appearance, with hugs for everyone, and children were able to visit a mobile tidepool provided by the New England Aquarium. From ballpark tours, scavenger hunts, Yoga, interactive computer games, to face painting and balloon animals, these families got to experience Fenway Park like never before. As lunchtime rolled around, Founder and Chairman Frank Strauss announced some exciting news, that everyone was invited on to the field to check out the Green Monster in person! Guests were led on to field for pictures and then brought up to the EMC club for lunch, with views from home plate, and World Series trophies on display. After lunch, children and families exited the ballpark with smiles, laughter, and of course gift bags. New this year, each child received their own Pillow Pet graciously donated by Family Reach Foundation! When Boston Duck Tours departed the ballpark filled with families the fun did not end there, everyone received B.Good Milkshakes and Insomnia Cookies for the trip home. Expect Miracles Foundation would like to thank Miracle Sponsor Income Research + Management, Hero Sponsor DCU for Kids, and Hope Sponsor Putnam Investments. We would also like to express our gratitude toward all of our supporters, donors, and volunteers. Your contribution has given these inspiring and courageous families a chance to make memories and have fun! Together, we can expect miracles, and continue to make Kids Golf Day a remarkable community event!